There are very few figures who have dominated their nation, and have been as internationally renowned, as Fidel Castro, who has died aged 90 at home in Cuba. 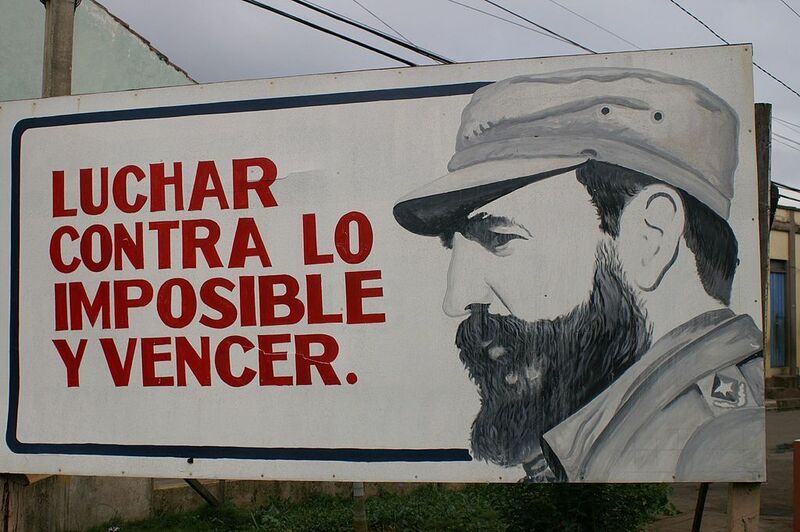 The leader of the 1959 revolution that overthrew the dictatorship of Fulgencio Batista, Castro catapulted the tiny island to the forefront of international geopolitics during the height of the Cold War. One of the last bastions of Marxism-Leninism, Castro led the country for 49 years, finally retiring in 2008 and handing power to his brother Raúl. On his arrival in Havana following the felling of Batista many Cubans saw Castro as representing a fresh start, the possibility of a new democratic era. Instead, he tore down democratic institutions and installed himself as a total leader via repression of opposition, jailing of political opponents and summary executions. He was a tyrant of total and unparalleled power, a control-freak egomaniac who shaped the nation in his image. Perhaps he was most famous for his prickly relationship with the United States, who attempted to overthrow him with the failed Bay of Pigs invasion in 1961, and reportedly sought to assassinate him 638 times during his reign. As a communist outpost in the Western Hemisphere, Cuba became a crucible in the Cold War at the centre of the Cuban Missile Crisis in 1962, and Castro supposedly lobbied Nikita Khruschev to fire on the US forces. He managed to free Cuba from the US imperialism of the Batista regime, and proceeded to outlast 10 US Presidents, with no thaw in relations. At home, Castro was responsible for internationally isolating Cuba, especially following the end of the Soviet Union, which precipitated a collapse in the Cuban economy. His supporters will point to the legacy of a nation with education and healthcare standards which far outstrip far more economically developed, capitalist, nations. This, however, came at the cost of massive shortages of even the most basic goods, such as hand soap, and massively inflated prices. Ironically, in a nation which has such a high standard of literacy, many books are unaffordable. Regardless of these social developments, Castro’s regime instituted brutal restrictions on human rights. LGBT people were regularly discriminated against (something Castro later claimed he regretted) and there was repression of all dissenters to the regime, including the creation of labour camps and the continued jailing of political opponents. Many Cubans sought to flee the regime, with many placing their lives in the hands of people smugglers to make the dangerous crossing to Florida or Mexico. Since handing over power in 2008 Castro largely disappeared from public life, his ill health preventing him venturing far from his garden, but he made semi-regular appearances (partly to demonstrate he was still alive) but it was obvious that he was wasting away. The hero of the revolution, adorned in his traditional khaki, with cigar seemingly always in place, replaced by a frail, grey haired old man in an Adidas tracksuit (another irony) who appeared unable to stand for any length of time. Many dictators try to hide their flaws and frailty, yet Castro seemed uninterested, perhaps preparing the nation he built for the future it now faces. Since 2008 Cuba has faced up to its economic reality and Raul has opened it up to the world, including this year coming to a rapprochement with President Obama and the United States which has seen trade and custom slowly re-start between the two old foes. This small move towards dismantling Fidel’s legacy, even as the old figurehead was still alive, can be seen as an acceptance that the world has moved on from the time in which Castro took power, no longer can Cuba isolate itself entirely. In Cuba, there will be nine days of national mourning. In Miami, there were impromptu street parties as Cuban ex-patriots celebrated the death of a man who had systematically destroyed their rights and freedoms at home. This, if anything, demonstrates the divide over Castro. At home there are still some who revere him, and will continue to do so following his death, but those who have left the island despise what he turned their country in to. Despite the undoubted social progress made under his leadership, his despicable human rights record will likely be what he is remembered for. What has become apparent following his death is that he is one of the uniquely charismatic figures in modern history, with commentators taking to Twitter to argue the legacy of a man who led a tiny island nation of under 12 million people. One quote mentioned prominently since the announcement of his death came from his 1953 trial where he said, ‘History will absolve me’. This will unlikely be the case, but the legacy of Castro as a global icon, an unremitting tyrant, a social reformer and a human rights abuser is one which will be discussed by many future historians.